Ó 1933 go 1945, bhí an Ghearmáin faoi smacht Pháirtí Náisiúnta Sóisialach Lucht Oibre na Gearmáine, agus Gearmáin na Naitsithe a thugtar ar an tréimhse seo i stair na tíre. Tugtar An Tríú Reich (Drittes Reich i nGearmáinis) ar stát na Naitsithe toisc gur tháinig sé i gcomharbas ar Impireacht Naofa Rómhánach na Meánaoise agus Impireacht na Gearmáine 1871–1918. Deutsches Reich (Reich Gearmánach) an t-ainm a bhí air ó 1933 go 1943, agus ansin baisteadh an t-ainm Großdeutsches Reich air. Is é an Naitsíochas (Gearmáinis: Nationalsozialismus - tá an leagan Nazismus ann chomh maith, ach ní chluintear chomh minic céanna é) an t-ainm a thugtar ar idé-eolaíocht na Naitsithe (Gearmáinis: Nazis), arbh iad baill agus lucht leanúna Pháirtí Náisiúnta Sóisialach Lucht Oibre na Gearmáine (Nationalsozialistische Deutsche Arbeiterpartei, NSDAP) iad. Gluaiseacht chiníoch, fhrith-Ghiúdach ab ea na Naitsithe, agus Adolf Hitler ina cheannaire diansmachtúil orthu. Bhí na Naitsithe i réim sa Ghearmáin sna blianta 1933-1945, agus ba iadsan a chuir tús leis an Dara Cogadh Domhanda. Faoi thionchar na Naitsithe, tháinig rialtais soip ar an bhfód i dtíortha eile a raibh cuma an Naitsíochais orthu, cosúil le rialtas Vidkun Quisling san Iorua. I mblianta an Naitsíochais, bhí Hitler ina dheachtóir ar an nGearmáin, agus é ag cur polasaithe coiriúla i gcrích le cabhrú na Naitsithe. Tháinig coincheap an tSóisialachais Náisiúnta ar an bhfód mar theideal ar chuspóirí Phairtí Lucht Oibre na Gearmáine (Deutsche Arbeiterpartei, DAP), a tharraing an t-ainm nua úd NSDAP, nó Páirtí Sóisialach Náisiúnta Lucht Oibre na Gearmáine air féin sa bhliain 1920. Roimhe sin féin, i Mí Bhealtaine 1918, fuair Páirtí Gearmánach an Lucht Oibre san Ostair ainm nua den chineál chéanna - Deutsche Nationalsozialistische Arbeiterpartei - Páirtí Sóisialach Náisiúnta Gearmánach an Lucht Oibre. Thairis sin, theastaigh ó Hitler a idé-eolaíocht féin a dhealú ón bhFaisisteachas, a bhí tagtha ar an bhfód san Iodáil faoi chomandracht Benito Mussolini. San Aontas Shóivéadach, áfach, ba ghnách Faisisteachas a thabhairt ar an dá idé-eolaíocht seo ón mbliain 1925 ar aghaidh, agus i ndiaidh an Dara Cogadh Domhanda, d'éirigh an úsáid seo coitianta i dtíortha Oirthear na hEorpa, a bhí ina satailítí polaitiúla ag an Aontas Sóivéadach. San Iarthar féin ba leasc leis an lucht léinn Marxach úsáid a bhaint as an téarma "Sóisialachas Náisiúnta" le tagairt don Naitsíochas, ó b'ionann sin dar leo agus aitheantas a thabhairt don chiallú gur sórt Sóisialachais é an Naitsíochas. Is é an tuiscint a bhí ag na Marxaigh gur cineál aicmeachas buirgéiseach a bhí i gceist leis an bhFaisisteachas. Níor bhain Adolf Hitler amach saoránacht na Gearmáine ach i Mí Feabhra 1932, ach nuair a bhí sé ina Ghearmánach go hoifigiúil, bhí cead iarrthóireachta aige i dtoghcháin Uachtaránachta na bliana céanna. Ba é an seanmharascal cogaidh Paul von Hindenburg a ghnóthaigh an báire sin, ach bhí Hitler go tiubh sna sálaí aige, agus b'éigean athvótáil a chóiriú, toisc nach bhfuair aon duine de na hiarrthóirí a dhóthain vótaí sa chéad bhabhta. I Mí na Samhna, 1932, chuaigh na Gearmánaigh chuig an mbosca ballóide in athuair, áfach, agus olltoghchán nua ar siúl. An uair sin, b'iad na Naitsithe an páirtí ba mhó sa Pharlaimint, agus ar an 30ú lá de Mhí Eanáir 1933, cheap an tUachtarán Hindenburg Adolf Hitler mar Sheansailéir. Na coimeádaigh agus na míleataigh timpeall ar Hindenburg, bhí siad ag áitiú ar an Uachtarán rialtas náisiúnaíoch a cheapadh agus Hitler a chur ina cheannas. Bhí tacaíocht ag teacht do Hitler i gcónaí ó na gróintíní tionsclaíochta agus ó na baincéirí, nó bhí siad den bharúil gurbh eisean an sciath chosanta ab fhearr ar na Cumannaigh. Thairis sin, má bhí Hitler ag gealladh atharmáil na tíre, b'ionann sin agus an tionsclaíocht a chur ag táirgiú treallamh cogaidh don Stát, agus ar ndóigh, ba díol spéise é sin do na gróintíní. Bhí claontachtaí áirithe taobh istigh den NSDAP féin chun frithchaipitleachais, ach má bhí, bhí éirithe le Hitler iad a choinneáil faoi smacht, rud a thaitin go mór le lucht an rachmais, ní nárbh ionadh. B'fhearr le Hitler, ar ndóigh, an milleán a fhágáil ar na Giúdaigh, seachas ar na rachmasóirí. In óráid a thug sé do Chlub Tionsclaíochta Düsseldorf sa bhliain 1932, mhol Hitler na scothaicmí caipitleacha, agus é ag rá nach dtiocfadh rath ná bláth ar eacnamaíocht na Gearmáine choíche, dá mbeadh "duine as gach beirt den tuairim gurb ionann rachmas agus gadaíocht" - tagairt a bhí anseo do na Daonlathaigh Shóisialta agus do na Cumannaigh. Na coimeádaigh náisiúnaíocha, arís, chinntigh Hitler a dtacaíocht siúd dó féin nuair a ghlac sé le Franz von Papen mar Leas-Sheansailéir. Bheadh cead ag Papen bheith i láthair agus an Seansailéir ag dul i bhfianaise an Uachtaráin. Shíl von Papen féin go mbeadh sé in ann "srianta a choinneáil le Hitler" ar an dóigh seo. Bhí dóchas ag na míleataigh go dtreiseodh Hitler leis na fórsaí armtha agus go gcuirfeadh sé Conradh Versailles ar ceal. Maidir leis na coimeádaigh náisiúnaíocha, bhí siadsan ag dréim le tuilleadh cobhsaíochta i saol polaitiúil na tíre agus le cultúr polaitiúil nua a bheadh níos cairdiúla i leith na monarcachta. San oíche idir an 27ú agus an 28ú lá de Mhí Feabhra 1933, chuaigh áras an Reichstag - is é sin, áras na Parlaiminte - trí thine. An fear a rinne é, mar atá, an tOllannach Marinus van der Lubbe, bhí barúlacha aige a raibh cuma éigin na heite clé orthu, cé gur fear mire ann a bhí thar aon rud eile. Mar sin féin, is é an chiall a bhain na Naitsithe as an scéal gur sceimhlitheoir Cumannach a bhí ann, agus iad ag éileamh cumhachtaí speisialta le feachtas sceimhlitheoireachta an Idirnáisiúntáin Chumannaigh a stopadh. D'áitigh Hitler ar an Uachtarán Hindenburg na dlíthe éigeandála a chur i bhfeidhm, rud a chuir ar chumas an tSeansailéara na cearta sibhialta bunaidh a chur ar ceal. Ní fhéadfaí na dlíthe éigeandála a choinneáil i bhfeidhm ach go sealadach, agus theastaigh ó Hitler dlíthe seasta den chineál chéanna a reachtú. Chuaigh sé i dtuilleamaí a chuid lucht leanúna sna póilíní agus sna fórsaí slándála leis na Cumannaigh agus le cuid de na Sóisialaigh Dhaonlathacha a eisiamh as an bParlaimint, le go bhféadfadh sé tromlach dhá dtrian a chinntiú dó féin agus dá chuid dlíthe speisialta. Bhí na páirtithe neamh-Shóisialacha sásta a vótaí a chaitheamh i bhfách leis na dlíthe speisialta a bhronn cumhachtaí neamhghnácha ar Hitler (Ermächtigungsgesetze nó dlíthe cumhachtaithe a thugtaí orthu as Gearmáinis). Nuair a chuaigh na dlíthe seo um chumhachtaí speisialta do Hitler i bhfeidhm (ar an 23 Márta 1933), tháinig deireadh le daonlathas Phoblacht Weimar, agus thosaigh ré na deachtóireachta, nó ré an Tríú Reich. Ar an 14 Iúil 1933, bhí gach páirtí polaitiúil sa tír coiscthe seachas na Naitsithe. Ba é Ernst Röhm an t-aon duine amháin a bhí in aon neasacht do bheith ábalta ollchumhacht Hitler a cheistiú faoin am seo. Ní raibh aon duine eile ag tabhairt Du in áit an cheiliúir fhoirmiúil úd Sie ar Hitler, agus thairis sin, d'fhéadfá a rá go raibh Hitler faoi chomaoin ag Röhm, a chuidigh go mór leis nuair nach raibh sé i mbéal an phobail go fóill. Bhí go leor daoine sa Pháirtí a bhí ag iompairc le Röhm faoi ghnaoi Hitler, cosúil le Heinrich Himmler, Hermann Göring agus Reinhard Heydrich, agus iad uile ag tabhairt le fios don deachtóir nach raibh Röhm iontaofa. Ar an 30 Meitheamh 1934, "Oíche na Scian Mór", phurgaigh Hitler a pháirtí. Maraíodh Röhm agus ceannairí eile an SA, chomh maith le sraith de ghinearáil agus daoine eile nach raibh ag taitneamh le Hitler ar chúis éigin. Cuid acu, bhí siad dáiríribh ag cur in aghaidh Hitler, ach ní raibh sa chuid eile ach Naitsithe dílse nó náisiúnaithe coimeádacha a fuair Hitler riachtanach a chur chun báis ar eagla na heagla. Mar shampla, maraíodh an Ginearál Kurt von Schleicher agus a bhean chéile, toisc go raibh von Schleicher féin ina Sheansailéir tráth, roimh lá Hitler. I ndiaidh bhás Hindenburg ar an dara lá de Mhí Lúnasa sa bhliain 1934, chuir Hitler ar na fórsaí armtha mionnaí dílseachta a mhóidiú dó féin, agus ón lá sin amach, bhí sé ina Cheannaire agus ina Sheansailéir araon - is é sin, Führer und Reichskanzler. I Mí Eanáir 1938, cuireadh Werner von Blomberg, arbh é an tAire Cogaidh é, agus an Ginearál-Choirnéal Werner von Fritsch, Ard-Cheannasaí an Chos-Slua, as oifig. Ba é an SS a tharraing callán orthu. Maidir le Blomberg, cuireadh bean óg, Erna Gruhn, in aithne dó a bhí ina hiar-striapach agus ina hiar-chuspa d'irisí pornagrafaíochta. Thit Blomberg i ngrá leis an gcailín, cé gur fear cnagaosta a bhí ann cheana féin, agus phós sé í. Ar dtús, ní raibh Hitler ná Göring míshásta ar aon nós ná slí le scéal grá an Ghinearáil, cé go bhfuil a mhuintir-sean ar an daoraí faoin bpósadh. A mhalairt ar fad, thug Hitler agus Göring in iúl do Bhlomberg gur dea-shiombail d'aontas nua na Gearmáine a bheadh ann dá bpósfadh ginearál de phór uasal cailín simplí cosúil le hErna. Níor tháinig fíor-scéal Erna chun solais ach i ndiaidh na bainise, agus ansin, bhí port Bhlomberg seinnte mar mhíleatach proifisiúnta. Maidir le Fritsch, arís, cuireadh ina leith go raibh sé ina homaighnéasach. Mar sin, d'éirigh le Hitler ceannasaithe an Airm a náiriú agus a chur as oifig, agus ina dhiaidh sin, bhí sé féin i gceannas na bhfórsaí armtha chomh maith leis an stát sibhialta. Spreagadh tábhachtach do pholasaithe Hitler ab ea an frith-Ghiúdachas a bhí meáite ar na Giúdaigh a mharú scun scan, chomh maith le leagan radacach den Darwineachas sóisialta. Ón chéad lá ar tháinig sé os comhair an tsaoil mhóir go dtí lá a bháis, ba nós le Hitler na Giúdaigh agus na "ciníocha ar bheagán fiúntais" a ionsaí ina chuid óráidíochta. Ciníocha ar bheagán fiúntais ab ea na Giofóga, na Polannaigh agus na Rúisigh, mar shampla. Maidir leis an Darwineachas sóisialta, tháinig sé chun solais ina chuid cainteanna faoi dhaoine a raibh galar, máchail nó easláinte orthu, agus é ag rá gur "beatha neamhfhiúntach" (lebensunwertes Leben) a bhí i gceist leo. Is é an dearcadh a bhí ag Hitler ar stair an chine dhaonna nach raibh ann go bunúsach ach síorchath ina raibh na dea-chiníocha agus an bheatha fhiúntach ag díothú na ndroch-chiníocha agus na beatha neamhfhiúntaí. Mar shampla, dúirt sé ag Ard-Fheis a pháirtí i Nürnberg sa bhliain 1929: "Dá saolófaí milliún leanbh don Ghearmáin in aghaidh na bliana, agus 700,000-800,000 duine den chuid is laige á ndíothú san am céanna, is féidir gur méadú ar ár bhfórsaí a bheadh ann." Ar dtús, tháinig frith-Ghiúdachas Hitler agus na Naitsithe chun solais sa dóigh a ndéantaí leatrom oscailte ar na Giúdaigh, agus a gcuid cearta sibhialta á mbaint díobh. Le linn an Dara Cogadh Domhanda, chuaigh an polasaí sin chun géaradais nuair a tosaíodh ar na Giúdaigh a mharú ina sluaite - an tUileloscadh, mar a thugtar air. Bhí sé tugtha le fios ag Hitler ina leabhar Mein Kampf gur theastaigh uaidh na Giúdaigh go léir a chur de dhroim an tsaoil, mar "fhuascailt dheiridh" ar an "gceist Ghiúdach". Áirítear go raibh timpeall ar shé mhilliún Giúdach ar feadh na hEorpa thíos leis an bhfeachtas ollscriosta seo. I ndiaidh don Dara Cogadh Domhanda pléascadh amach, ní ghabhfadh Hitler leor le gnáth-ghéarleanúint na nGiúdach a thuilleadh - theastaigh uaidh iad a mharú agus a dhíothú go fisiciúil. Ní raibh cead eisimirce ag na Giúdaigh a thuilleadh, agus de réir mar a bhí trúpaí na Gearmáine ag forghabháil tíortha eile, bhí géarleanúint na nGiúdach ag dul i bhfairsinge. Ón chéad lá de Mhí Mheán Fómhair 1941 i leith, chaithfeadh na Giúdaigh go léir, a bhí ní ba sine ná sé bliana d'aois, an réalta bhuí a fhuáil dá gcuid éadai ionas go mbeadh sí le feiceáil go héasca. Cuireadh srianta éagsúla le saol na nGiúdach. Ní raibh cead acu dul ar bhord na mbusanna, ná gluaisteán, raidió nó fiú madra nó cat a bheith acu. De réir a chéile, chaithfidís a seantithe agus a seanárasáin a thréigean le haghaidh a thabhairt ar na geiteonna agus na campaí géibhinn. Sa bhliain 1942, tógadh na chéad champaí díothúcháin sa Pholainn, a bhí forghafa ag na díormaí Gearmánacha: Auschwitz-Birkenau agus Majdanek. Sna campaí díothúcháin, bhí na daoine á marú mar a bheadh tionsclaíocht ann, is é sin, b'éigean dóibh dul isteach i seomraí gáis inar tachtadh iad le hidriginchiainíd ("aigéad hidricianach", "Zyklon B"). Níorbh iad na Giúdaigh amháin a bhí á marú iontu, ach Polannaigh Chaitliceacha - intleachtóirí ach go háirithe, nó níor theastaigh ó Hitler aos léinn dá gcuid féin a fhágáil ag na náisiúin Shlavacha - agus Giofóga, ach go háirithe. Iad siúd atá ag iarraidh an tUileloscadh a shéanadh, tá siad ag áitiú nach féidir Hitler a chiontú san Uileloscadh, ós rud é nár thángthas trasna ar aon doiciméad oifigiúil ina mbeadh Hitler féin ag ordú go ndíothófaí na Giúdaigh, doiciméad a bheadh sínithe ag an deachtóir. Ón taobh eile de, tá sé soiléir go hiomlán go raibh an cinedhíothú ag freagairt dá mhianta pearsanta. Luaigh sé cinedhíothú na nGiúdach ina leabhar Mein Kampf, ag tabhairt le fios gur shíl sé gur cuidiú le cás na Gearmáine sa Chéad Chogadh Domhanda a bheadh ann dá gcuirfí na Giúdaigh chun báis san am sin, agus in óráid a thug sé don Pharlaimint (Reichstag) ar an 30ú lá de Mhí Eanáir 1939, bhagair sé go gcuirfeadh sé "cine na nGiúdach san Eoraip de dhroim an tsaoil" dá mbeadh cogadh ann. De réir mar ba chuimhin le Heinrich Himmler, d'ordaigh Hitler go pearsanta in Earrach na bliana 1941, agus é dóchasach i gcónaí go mbeadh an lá ag an nGearmáin, go marófaí na Giúdaigh go léir. Dúirt Himmler lena shuathaire pearsanta, Felix Kersten, san am céanna, roimh an ionsaí ar an Aontas Sóivéadach, nár mhór "na Giúdaigh, gach aon duine acu, a dhíothú roimh dheireadh an chogaidh. Sin é an rud atá ag teastáil ón bhFührer." Sa bhliain 1943, nuair a bhí breithlá an deachtóra á cheiliúradh, thug Himmler óráid do cheannairí an SS agus iad cruinnithe i bPosen (Poznań sa Pholainn), agus é ag trácht go hoscailte ar an Uileloscadh agus ar an dóigh a gcuirfí i gcrích é. Is éadócha go ndéanfadh sé a leithéid gan faomhadh soiléir a fháil roimh ré ón bhFührer. Ba le Philipp Bouhler, a bhí i gceannas ar oifig phearsanta Hitler i bpáirtí na Naitsithe (Führerkanzlei), a thit sé scéim na heotanáise a thabhairt i gcrann. D'iompaigh sé tithe téarnaimh agus banaltrais ina dtithe báis. Sa Ghearmáin féin, maraíodh beagnach 190 000 duine a raibh máchail éigin orthu - titimeas, mar shampla. Tachtadh cuid acu le gás cosúil leis na cimí sna campaí géibhinn, cuid eile tugadh nimh de chineál eile dóibh, bhí dornán ann a lámhachadh scun scan, agus fágadh dream eile fós gan bia go dtí go bhfuair siad bás le hocras. Is deacair a fháil amach, cé mhéid a básaíodh ar an dóigh seo sa chuid den Eoraip a bhí forghafa ag na trúpaí Gearmánacha. Fuair eaglaisigh sa Ghearmáin amach faoi scéim na heotanáise agus cháin siad í go poiblí - is fiú Clemens August von Galen, easpag Caitliceach Münster, a ainmniú mar dhuine acu - agus b'éigean don SS tuilleadh rúndachta a chleachtadh leis an scéim a leanúint. I ndeireadh an chogaidh, bhí duine as gach beirt de na heasláin sna tithe banaltrais agus téarnaimh curtha chun báis. Ócáid oiliúna ab ea scéim na heotanáise do thascfhórsaí an SS le haghaidh an ródaigh a bhítí a ullmhú do na Giúdaigh. Cosúil le polaiteoirí daonlathacha Phoblacht Weimar féin, bhí Hitler ag iarraidh conradh síochána Versailles a athbhreithniú nó a chur ar ceal. Murab ionann agus iad siúd, áfach, ní raibh sé sásta le canálacha na taidhleoireachta amhán, - chuir sé an cogadh san áireamh chomh maith. Bhí meáiteacht Hitler i gcúrsaí an pholasaí eachtraigh le haithint ó Mhí Dheireadh Fómhair na bliana 1933 amach, nuair a d'éirigh an Ghearmáin as na comhchainteanna dí-armála leis an mBreatain Mhór agus leis an bhFrainc. San am céanna, d'fhág an Ghearmáin slán ag Conradh na Náisiún chomh maith. Sa bhliain 1934, dhúnmharaigh na Naitsithe áitiúla Seansailéir na hOstaire Engelbert Dollfuss, agus tacaíocht acu ó Hitler, nó bhí siad ag iarraidh teacht i gcumhacht san Ostair agus an tír a nascadh leis an nGearmáin, scéim nár éirigh léi go fóill san am sin. Cosúil leis sin, bhí Hitler ag tacú le Franco i gCogadh Cathartha na Spáinne ón mbliain 1936 ar aghaidh. Cuidiú tábhachtach ab ea é le Franco na heitleáin Ghearmánacha - "Léigiún na gCondar" - a chuir Hitler go dtí an Spáinn, ach is dócha gurbh é an cleachtadh cogaidh dá chuid eitleoirí ba mhó a bhí ag teastáil ón deachtóir Gearmánach. Ar an gcúigiú lá de Mhí na Samhna 1937, chuir Hitler na ginearáil in eolas a chuid pleananna cogaidh. Dúirt sé go hoscailte "gurbh é an cogadh an t-aon fhreagra ar cheist na Gearmáine", agus é ag tabhairt le tuiscint go gcaithfí an chéad seans eile a thapú leis an tSeicshlovaic agus an Ostair a ghabháil. I Mí na Márta 1938, d'éirigh le Hitler an Ostair a iompú ina cúige Gearmánach, "Ostmark" ("Na Críocha Thoir") mar a baisteadh uirthi. I Mí Dheireadh Fómhair, d'éiligh sé go dtabharfadh an tSeicshlovaic na tailte in aice leis an teorainn - Sudeten - don Ghearmáin, ós rud é gur Gearmáinis ba mhó a bhí á labhairt ag muintir na gcríoch seo. Ós rud é go raibh conradh comhghuaillíochta ag an tSeicshlovaic leis an bhFrainc agus le Sasana, bhí cogadh ag bagairt san am sin féin. 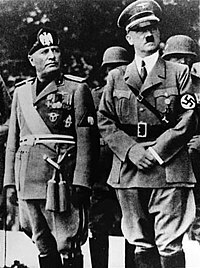 Bhí Mussolini inbharúla nach raibh an Iodáil ullamh don chogadh go fóill, agus chuaigh seisean ag déanamh idirghabhála. Dá thoradh sin, tháinig Príomh-Airí na Breataine Móire agus na Fraince, Neville Chamberlain agus Édouard Daladier, go München le haghaidh comhchainteanna le Hitler. Ní raibh siadsan den tuairim, ach an oiread, go mbeadh a dtíortha in ann ag an gcogadh, agus mar sin, bhí siad géilliúil d'éilimh Hitler. Mar sin, d'fhág siad cead aige na críocha ag an teorainn a ghabháil. Cé gur chuir Hitler urra le slándáil na Seicshlovaice, ní raibh sé mall ag briseadh a ghealltanais. I Mí na Márta 1939, chuir sé deireadh leis an tSeicshlovaic mar thír neamhspleách. Chuidigh sé leis na náisiúnaithe Slóvacacha a leath féin den tír a iompú ina "stát neamhspleách" faoi choimirce na Gearmáine - le fírinne, ní raibh an stát seo neamhspleách ar an nGearmáin ar aon nós. An chuid eile den tSeicshlovaic, hiompaíodh ina "coimirceas" í, is é sin, níor fágadh oiread is cuma an neamhspleáchais uirthi. Nuair a bhí an tSeicshlovaic curtha de dhroim an tsaoil, dúirt Hitler in óráid a thug sé don Reichstag go raibh a dóthain tailte ag an nGearmáin anois. Mar sin féin, cúpla mí ina dhiaidh sin, thosaigh sé ag éileamh go gcuirfí Danzig leis an nGearmáin - san am sin, bhí an chathair seo ina Saor-Chathair a raibh stádas an stáit neamhspleách aici. I Mí Lúnasa 1939, shínigh sé conradh - Conradh Ribbentrop agus Molotov - leis an Aontas Sóivéadach inar socraíodh go mbeadh iarthar na Polainn ag titim leis an nGearmáin dá gcuirfí "cuma nua ar na tíortha" in Oirthear na hEorpa. Nuair a chuaigh sé ag éileamh a chuid féin den Pholainn, phléasc an Dara Cogadh Domhanda amach. Ar an gcogadh seo a bhí sé meáite ón lá ar tháinig sé i gcumhacht sa Ghearmáin. An dóigh ar iompair sé é féin ón gcruinniú mullaigh i München ar aghaidh, áfach, chuaigh sé i gcion ar lucht rialtais na Fraince agus na Breataine Móire nárbh fhéidir muinín a bheith agat as Hitler. Dá dtabharfá dó an rud a bhí ag teastáil uaidh, ní bheadh sé i bhfad ag éileamh tuilleadh. Nuair a bhí an conradh sínithe, ba léir do chách go raibh an cogadh ag teacht. Go gairid ina dhiaidh sin, thosaigh Hitler ag éileamh ar an bPolainn go dtabharfadh sí uaithi na tailte a dtugtaí "Bealach na Polainne" orthu. Is amhlaidh go raibh Oirthear na Prúise, an cúige ab fhaide thoir den Ghearmáin, scartha ón gcuid eile den tír ag an "mbealach" seo ó shíocháin Versailles i leith. Theastaigh uaidh freisin Saorchathair Danzig - an cathairstát neamhspleách - a chur leis an nGearmáin. De réir mar a hordaíodh dóibh, bhí nuachtáin na Gearmáine ag foilsiú scéalta uafáis faoi na hionsaithe agus na dúnmharuithe ar na Gearmánaigh áitiúla sa Pholainn agus ag éileamh ar Hitler teacht chun fortachta dóibh. I bhfómhar na bliana 1940, rinne aerfhórsa na Gearmáine, an Luftwaffe, iarracht forlámhas spéire na Breataine Móire a bhaint de na Sasanaigh. D'éirigh ina chogadh dearg idir na Gearmánaigh agus na Sasanaigh, ach sa deireadh thiar, b'iad na Sasanaigh a ghnóthaigh an cath seo - Cath na Breataine. Ba é sin an chéad uair a briseadh aon mhórchath ar an nGearmáin sa chogadh. An plean a bhí ag Hitler trúpaí Gearmánacha a chur i dtír i ndeisceart Shasana, is é sin, "Oibríocht Seelöwe", b'éigean dó é a chur i leataobh. Ina áit sin, ghlac Hitler leis nár bhaol dó Sasana i láthair na huaire, agus chrom sé ar fhíor-chuspóir a chogaidh, is é sin, an t-ionradh soir. Ar dtús, tháinig díormaí na Gearmáine chun fortachta do Mussolini a bhí díreach ag iarraidh an Ghréig a chur faoi chois, rud nach raibh ag éirí lena chuid fórsaí. Theastaigh ó Hitler na tíortha Balcánacha go léir a fhorghabháil le taobh theas an chathéadain in aghaidh an Aontais Shóivéadaigh a choinneáil faoi smacht. Thosaigh an t-ionsaí ar an Aontas Sóivéadach - "Oibríocht Barbarossa" ar an 22ú lá de Mhí Iúil, 1941. Rinne bolscaireacht na Naitsithe idéalú ar an ionradh seo mar "chath an Iarthair in aghaidh dhorchadas na hÁise agus an Oirthir". Cuireadh béim ar leith ar chomh barbartha is a bhí na Rúisigh agus ar ról na "mBoilséiveach Giúdach" i bhforbairt an chórais Chumannaigh. Tugadh le fios, fosta, go raibh Hitler leis na Sóivéadaigh a shaoradh ó bhráca an Bhoilséiveachais, ach tríd is tríd, cogadh díothúcháin a bhí ann, an chuid is mó. Cé go raibh fórsaí armtha na Gearmáine ag comhoibriú in áiteanna le náisiúnaithe frith-Rúiseacha a raibh ag teastáil uathu a dteanga agus a gcultúr a chur chun cinn i ndiaidh dóibh saoirse a fháil ó chuingir an Aontais Shóivéadaigh, is é an plean a bhí ag Hitler na náisiúntachtaí seo a chur i ndaoirse agus an tsibhialtacht, an léamh agus an scríbhneoireacht féin a bhaint díobh sa deireadh thiar thall. Ar ndóigh, bhí Hitler meáite ar na Giúdaigh san Aontas Sóivéadach a mharú scun scan. Ní raibh coimpléasc capaill ag Hitler riamh, agus ag druidim chun deiridh don chogadh ní raibh sláinte an deachtóra ach ag dul chun donais. Creidtear inniu go raibh galar Parkinson air, agus é ag éirí néaltraithe chomh maith. Mar sin féin, bhí sé in ann geasa agus draíocht a chur ar na daoine ina thimpeall i gcónaí. Ar an 19ú lá de Mhárta 1945, d'eisigh sé an t-ordú ar a dtugtar an Nerobefehl go coitianta, nó "ordú Nero" - ordú atá ainmnithe as Nero, Impire na Róimhe, faoina ndeirtear gur chuir sé an Róimh trí thine d'aon ogham. Is é an rud a d'ordaigh Hitler dá chuid trúpaí ná infreastruchtúr na Gearmáine a dhíothú de réir mar a bhí siad ag cúlú. Níor aithin sé ach an dá rogha: an bua nó an léirscrios. Ba leis na Rúisigh an todhchaí, dar le Hitler, agus ní fhéadfadh na Gearmánaigh, anois, ach stáitse na staire domhanda a fhágáil ina ndiaidh agus imeacht de dhroim an tsaoil go hiomlán. Ní raibh Albert Speer, Aire na Téisclime Cogaidh, in inmhe an t-ordú seo a scaipeadh i measc na dtrúpaí a thuilleadh, ós rud é go raibh na línte cumarsáide briste faoin am seo. Thosaigh cultas an cheannasaí sa Ghearmáin sách luath, fiú i bhfad sular shealbhaigh na Naitsithe an chumhacht. Nuair a thit an tóin as ceannairc an bheoirhalla i München sa bhliain 1923, is é an tátal a bhain Hitler as an iomlán ná go gcaithfeadh sé féin dul i gceannas ar an bpáirtí agus ar an nGearmáin féin gan aon údarás eile a cheadú, ó ba é sin a chinniúint. Le fírinne ní raibh cosmhuintir an pháirtí ag súil lena mhalairt uaidh. Mar sin, b'ionann cultas an cheannasaí agus comhdhlúthú an pháirtí: de réir mar a thug na baill urraim agus dílseacht do Hitler, dúnadh na ranganna agus rinneadh dearmad de na deighiltí agus de na difríochtaí idé-eolaíocha. Na héasclínte a bhí ag scoilt an pháirtí roimhe sin, ní raibh siad tábhachtach a thuilleadh. Nuair a tháinig na Naitsithe i seilbh an stáit sa bhliain 1933, níor theastaigh uathu deachtóireacht mhíleata a dhéanamh de, ach stát ceannasach. Mar sin, d'fhéach siad chuige nach mbeadh cumhacht ar bith ag aon duine eile seachas ag Hitler: nuair a fuair an tUachtarán Hindenburg bás sa bhliain 1934, níor toghadh uachtarán nua don stát, agus sa bhliain 1938, d'éirigh na hairí rialtais as a gcuid cruinnithe, ó bhí iomlán na cumhachta ag Hitler agus ag a fhoireann pé scéal é. Is eol dúinn gur mhair an tAontas Sóivéadach beo breis is tríocha bliain i ndiaidh bhás Stailín, nuair a bhásaigh an Tríú Reich agus Adolf Hitler féin go comhuaineach. Is é is cúis leis seo ná go raibh difríochtaí prionsabalta in eagrú praiticiúil an dá dheachtóireacht. Nó bhí Hitler ag cur a ladair i ngach cineál cúrsaí, agus é ag eisiúint a chuid orduithe agus achtanna féin faoi seo is siúd. Mar sin, ní raibh an maorlathas in ann oibriú as a stuaim féin i ndiaidh a bháis. Bhí gach duine ag fanacht le horduithe oifigiúla ó Hitler, agus nuair nach raibh Hitler ann a thuilleadh, ní raibh an córas in ann maireachtáil ní ba mhó. Bhí an caidreamh neamhoifigiúil le Hitler ní ba tábhachtaí ná slabhra oifigiúil foirmeálta an cheannais. San Aontas Sóivéadach, bhí gach duine tábhachtach tar éis scolaíocht idé-eolaíoch Chumannach a fháil, agus muinín áirithe acu astu féin go raibh siad in ann cinneadh ar an rud ceart as a stuaim féin. Sin é an rud a choinnigh an tAontas Sóivéadach ag imeacht ar feadh i bhfad i ndiaidh bhás Stailín. William Sheridan Allen. The Nazi Seizure of Power : the Experience Of A Single German Town, 1922–1945 by New York ; Toronto: F. Watts, 1984. ISBN 0-531-09935-0. Martin Broszat. German National Socialism, 1919–1945 translated from the German by Kurt Rosenbaum and Inge Pauli Boehm, Santa Barbara, Calif.: Clio Press, 1966. Richard Overy & Timothy Mason "Debate: Germany, “Domestic Crisis” and War in 1939" pages 200–240 from Past and Present, Number 122, February 1989. Anthony Read. The Devils Disciples. W. W. Norton & Co., 2003. ISBN 0-393-04800-4. The Nazi Elite edited by Ronald Smelser and Rainer Zitelmann, translated by Mary Fischer, New York : New York University Press, 1993, ISBN 0-8147-7950-6. Martin Broszat: Der Staat Hitlers. Grundlegung und Entwicklung seiner inneren Verfassung. dtv, Reihe Weltgeschichte des 20. Jahrhunderts (1. Auflage 1969), 12. Auflage, München 1989, ISBN 3-423-04009-2. Ian Kershaw: Hitlers Macht. Das Profil der NS-Herrschaft. München 1992. Norbert Frei: Der Führerstaat. Nationalsozialistische Herrschaft 1933 bis 1945, 6. Auflage, München 2001, ISBN 3-423-30785-4. Klaus Hildebrand: Das Dritte Reich. Oldenbourg, 6. Auflage 2003, ISBN 3-486-49096-6. Richard J. Evans: Das Dritte Reich – Aufstieg. (Band 1 der dreibändig geplanten Geschichte des Dritten Reichs), München 2004, ISBN 3-421-05652-8. Ursula Wolf: Litteris Et Patriae: Das Janusgesicht der Historie, Franz Steiner Verlag, 1996, 516 Seiten, ISBN 3-515-06875-9, ISBN 978-3-515-06875-8. Michael H. Kater: Das „Ahnenerbe“ der SS 1935–1945: Ein Beitrag zur Kulturpolitik des Dritten Reiches, Oldenbourg Wissenschaftsverlag, 2006, 529 Seiten, ISBN 3-486-57950-9, ISBN 978-3-486-57950-5. Tugadh an leathanach seo cothrom le dáta an 20 Nollaig 2018 ag 07:23.